Massively popular among gamers, Twitch has become an important marketing platform for many gaming-related businesses. It has even become one of the leading social channels for businesses to execute their influencer marketing campaigns. Twitch is experiencing significant growth in terms of their user base. According to TwitchTracker, there were 2.2 million unique streamers on the platform during 2016. And between 2015 and 2017, the number of monthly broadcasters increased by 18% to more than 2 million unique broadcasters. As of May 2017, there were more than 100 million unique viewers every month. And more than 15 million people visited the platform on a daily basis during the same year. In 2018, the number of unique broadcasters per month has increased by 60.88% to 3.2 million. So there is an increase in the number of people using the platform to connect with other gamers. This also means there is a huge opportunity for marketers to reach out to a massive and relevant audience on Twitch. With an expanding user base, Twitch is also seeing an increase in video view time. In 2016, the total minutes watched increased by 21% from the previous year to 292 billion minutes. In 2017, this increased by 21.5% to 355 billion total minutes for the whole year. In 2018, there has already been an increase of 44.04% with 43 billion minutes watched every month. The increase in minutes watched isn’t just because of a rise in the Twitch user base. It seems like people are spending more time on the platform as well. Between 2012 and 2017, the amount of time spent daily on the platform per user increased by 25%. Now each user is spending 106 minutes every day on Twitch. Twitch is a convenient platform for influential gamers to monetize their influence. Their affiliate program allows users to earn revenue from game sales that originate from their channel. They also have a partner program, which enables broadcasters to earn a share of revenue generated from the broadcasts they make. By providing these monetization options, Twitch is increasingly becoming an ideal platform for influential creators in the gaming industry. So it’s no surprise that there are now 220,000 affiliates on the platform. And the number of partnered streamers increased by 100% between 2015 and 2017 to more than 27,000. Affiliates on Twitch are getting a lot of engagement, having been clipped more than 19.5 million times. Additionally, affiliate channels have received more than 5.7 billion chat messages. This shows that affiliates are starting conversations and engaging in them on the platform. There have been a total of 124 million clips created on the Twitch platform. These clips have been viewed more than 1.7 billion times. So you can see that users are creating a lot of content, which other users are interacting with. With the introduction of features such as Twitch alerts, broadcasters are finding it much easier to create content that will better engage their audiences. So we should expect to see a lot more of these features being implemented Twitch content going forward. Perhaps one of the reasons why affiliate marketing is thriving on the platform is because their users are open to advertising. 82% of users believe that sponsorship benefits the gaming industry. And 80% are accepting of brand sponsorships of specific teams and gamers. This means that the audience is receptive to brands promoting themselves through Twitch influencers. And they are more likely to listen to what an influencer is saying about your brand. And if you’re reaching out to an audience that is already receptive, you have a much better chance of winning them over. Twitch users are actively engaging with each other, according to the previously-cited Twitch Tracker report. There was a 55% increase in chat messages sent within the platform during 2016, with 14.2 billion chat messages. Besides this, there were a total of 153 million whispers sent through these chats. Twitch users seem to be very generous and open to donating for charity. According to their annual report, more than $30 million has been raised for charities on the platform. So marketers should take note that campaigns that support a good cause could be more effective to win over consumers on the platform. Recently, Twitch raised $40,000 through their Extra Life United program set up in association with Children’s Miracle Network Hospitals. As mentioned earlier, Twitch provides an excellent opportunity for influential gamers to monetize their influence. There is an increasing number of people who have managed to earn money through the platform. The annual report said that 223% more people are making money through Twitch from sponsorships and affiliate marketing. According to SuperData Research, gaming video content (GVC) generated $4.6 billion in revenue during 2017. What’s interesting is that Twitch contributed to 37% of this revenue generated. What’s even more interesting is that it only has 16% of GVC viewers. The same SuperData Research found that direct spending contributes to 51% of revenue generated on Twitch. This is impressive considering that the industry as a whole sees 31% of revenues coming from direct spending. So it’s no surprise that marketers are starting to move on to the Twitch platform to execute their marketing campaigns. League of Legends is currently the most popular game on Twitch, with almost 100 million hours of its gameplay being viewed as of February, 2017. The second most popular game is Counter Strike: Global Offensive. 40 million hours of the video gameplay has been watched by Twitch users on the platform. 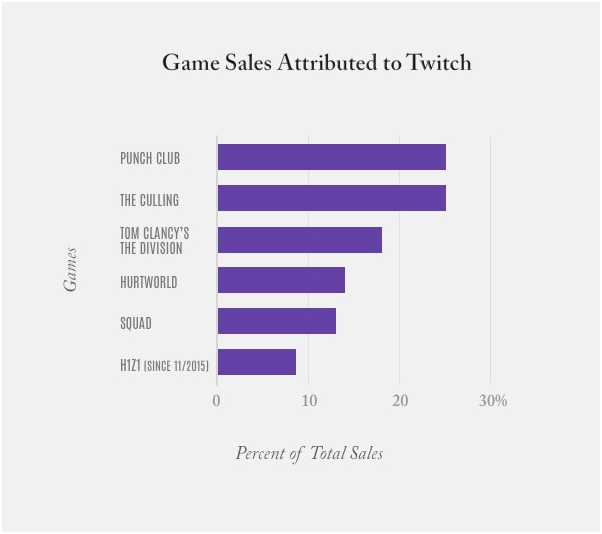 For some games such as The Culling and Punch Club, Twitch accounts for 25% of sales. The platform has also made significant contributions to the sales of other games including Tom Clancy’s The Division, Hurtworld, and Squad. This is likely because Twitch enables users to view high-quality gameplay that give them an idea of what they could enjoy while playing the game. It gives you the same experience that you would have while you’re sitting on the couch and watching your friend play the game in the same room. This helps many Twitch users decide which games are worth buying and which are not. 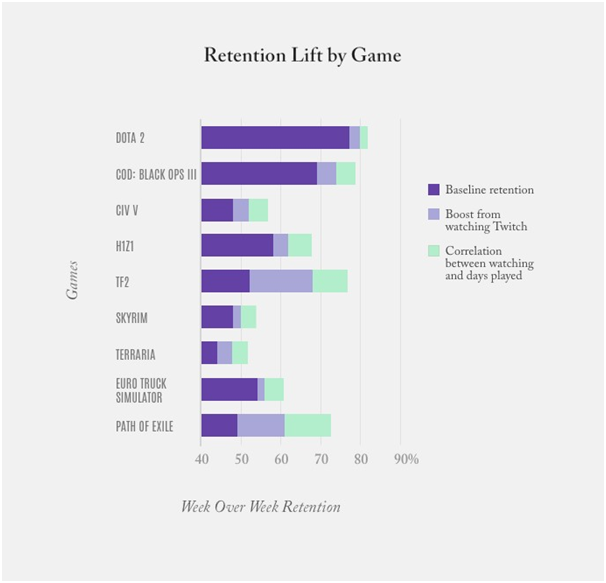 The high engagement rate among Twitch users helps increase user retention in associated video games. Twitch has resulted in a week over week increase in retention rate as high as 15% for some video games. As you can see in the chart below, games like TF2 and Path of Exile have seen a tremendous increase in player retention rate from watching Twitch. This is very important because it’s not enough that you get people to buy your video game. People should also want to play the game if you’re going to experience any growth. Dota players have a 5% higher chance of playing the game again if they watched it on Twitch. So it’s safe to say that watching gameplay on Twitch increases the desire in people to play the game again. No wonder so many companies are beginning to work with Twitch influencers to promote their video games. Streamlabs conducted an analysis on the monetization and segmentation data of YouTube Live and Twitch between 2015 and 2016. According to their analysis, they found that YouTube Live is getting a lot more active streamers than Twitch. Within six weeks, they witnessed a 36.6% increase in active streamers on YouTube Live, but the increase was only 4.1% for Twitch. However, they also found that Twitch has been able to generate a lot more revenue than YouTube Live. 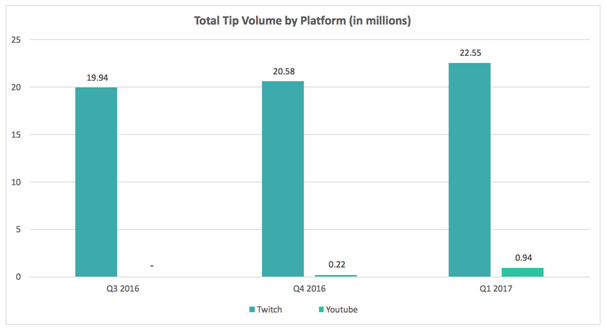 Streamers on Twitch got 96% of the tipping volume, while streamers on YouTube Live only got 4%. This means that Twitch is far more profitable for content creators who wish to make a living out of live streaming their gameplay. The increase in streamers on YouTube Live also means that there is more competition. So considering these numbers, Twitch seems like a much better option for content creators to monetize their influence. These 15 stats give you a closer look at Twitch and what the platform is capable of. Whether you’re a marketer who’s looking to invest in a campaign on the platform, or you’re a content creator, you now have a better idea what the platform can do for you. 6Degrees is a Leading Influencer Marketing Agency based in Copenhagen, Denmark with satellite offices in London and New York.